Raymarine’s new Axiom Pro RVX is their most advanced unit yet, offering both RealVision and 1kW CHIRP Sonar. The Hybrid Control 12-inch display has a lightening fast quad core processor. The included Lighthouse Nautical Charts makes the Raymarine Axiom 12 RVX a one stop shop MFD. Order a Minimum of $2500 in Raymarine Equipment Now Through July 7th, 2019 and get up to a $1500 Mail-In Rebate From Raymarine! 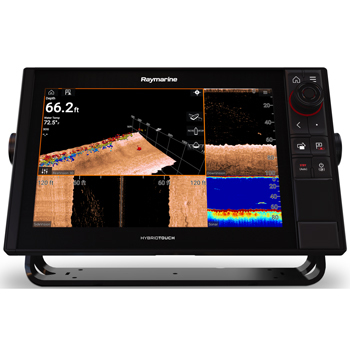 Raymarine's Axiom Pro RVX is the most advanced Axiom on the market offering a large 12" Hybrid Touch Display with built-in 1kW sonar capabilities supporting Low, Medium and High single CHIRP Frequencies along with 1kW 50/200 Transducers. The Axiom series has been synonymous with quality and performance over the years and the new Axiom Pro series only builds on existing features. The Axiom Pro provides detailed SideVision and RealVision views up to 300 feet. Enjoy DownVision views up to 600 feet and view depths up to 900 feet with high frequency CHIRP. Enjoy exceptional accuracy and target separation with the help of CHIRP technology. The Axiom 12 Pro is packaged with Lighthouse Charting for North America. This included charting is derived from NOAA charts and offers the essentials for navigation. If the included chart doesn’t provide the exact detail you are looking for the Axiom Pro is also Navionics Platinum Plus compatible for 4x higher resolution satellite photo overlay (the best available), full-view XGA panoramic pictures, improved 3D, and FREE high-definition fishing detail! The Quad Core processer is responsive, allowing users to work with multiple applications at once with no lag in system performance. The Raymarine Axiom Pro 12 RVX suits all preferences with its HybridTouch display, offering full control from the intuitive touchscreen, push button control pad or rotary dial. Designed around Raymarine’s Lighthouse 3 Software, the Axiom Pro is fast and fluid providing a simple user interface. Customizable to your liking, the Axiom allows you to drag and drop your databoxes anywhere on the screen – with 4 different size options and 14 different data types you can get your display exactly the way you want it. Lighthouse 3.1 includes RealVision 3D with GPS Tracking, Sonar Scrollback and Historical Sensitivity, 3D Waypoints, Autopilot Integration, Audio Control and More. 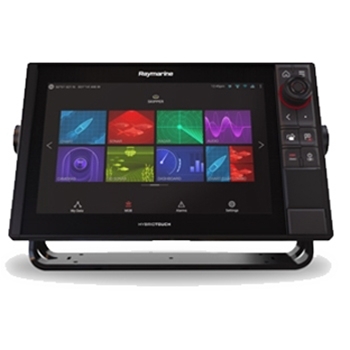 The Raymarine Axiom 12 Pro is compatible with multiple apps from Raymarine that will allow you to view and control your unit from a compatible smart device or tablet. Integrate Quantum, HD Color and Super HD Color Radars, CP 470 and CP 570 Sonar via Raynet, and Evolution Autopilot. Enjoy ClearCruise IR Analytics when your compatible FLIR Camera is networked. This technology automatically alerts you to obstacles in your path providing for a safer boating experience. You are able to connect up to 8 HD videos sources with IP video while being able to view up to 4 of them simultaneously. Built in Wi-Fi and Bluetooth are just a couple more advanced features that make the Axiom Pro RVX an all-around technically advanced unit. Whether you are in the market for a standalone GPS/Fishfinder or a full network setup, the Axiom Pro is sure to please even the pickiest angler. With so many options in screen size and extras there is sure to be an Axiom Pro for you! Each Raymarine AXIOM PRO 12 RVX comes with: Axiom Pro 12RVX Display, Lighthouse Mapping, Raynet (F) to Raynet (F) 2 Meter Cable, Trunnion Cover, Trunnion Knobs, Suncover, Power Cable (1.5M), Micro-C DeviceNet to STNG Cable (1M), Panel Seal Gasket, Mounting Parts, Quick Smart Guide, 3-Year Manufacturer’s Warranty. The Raymarine DeviceNet (Male) to STng (Female) snap-on spur adaptor allows for easy connection with NMEA2000 devices. The Maretron NMEA 2000 T-Connector is a required part when adding components to your NMEA 2k network. It is installed on the backbone cable and uses one end of the T-Piece for the drop cable. The Maretron NMEA 2000 Micro Inline Terminator can be used at the end of a NMEA 2000 backbone to terminate the backbone and still allow for a single device to be used after the terminator. Maretron is known for their high quality and durable NMEA 2000 parts, this starter kit includes: 2 T connectors, Powertap T, 2 Male Terminators, 1m Drop/Backbone Cable, and a 6m Drop/Backbone Cable. Everything you will need to start your NMEA 2K Network. The Raymarine STng (Male) to DeviceNet (Female) snap-on spur adaptor allows for easy connection to NMEA2000 devices. This Maretron cable can be used as your NMEA 2000 backbone or drop cable. Length 1 Meter. This Maretron cable can be used as your NMEA 2000 backbone or drop cable. Length 0.5 meter. The Maretron NMEA 2000 Field Attachable Male Connector is used to begin or end the NMEA 2000 Backbone. It should be installed on one side of a Micro-Tee. The Maretron NMEA 2000 Field Attachable Female Connector is used to begin or end the NMEA 2000 Backbone. It should be installed on one side of a Micro-Tee. This Maretron cable can be used as your NMEA 2000 backbone or drop cable. Length 6 Meter. Raymarine’s Quantum Q24C Radar is an 18” Dome Radar with Range Scales from 1/16th to 24 Nautical Miles. Offering the ability to connect via WiFi for a much easier installation and connection to any of Raymarine's MFDs with Lighthouse II (or later)software, the Q24C weighs 50% less than traditional Magnetron Radars and offers very low power consumption. Raymarine’s Quantum Q24C Radar is an 18” Dome Radar with Range Scales from 1/16th to 24 Nautical Miles. With simple connection via power and network to any of Raymarine's MFDs with Lighthouse II (or later)software, the Q24C weighs 50% less than traditional Magnetron Radars and offers very low power consumption. Includes either a 10m Power/Data Cable or 15M Power/Cable. The Maretron NMEA 2000 Male Terminator is used to begin or end the NMEA 2000 Backbone. It should be installed on one side of a Micro-Tee. Raymarine’s Quantum Q24W Radar is a Wi-Fi Only, 18” Dome Radar with Range Scales from 1/16th to 24 Nautical Miles. Compatible with any of Raymarines MFD’s with Lighthouse II software, the Q24W weighs 50% less than traditional Magnetron Radars and offers very low power consumption. This Maretron cable can be used as your NMEA 2000 backbone cable. Length 10 Meter. This cable can not be used as a drop cable. A NMEA 2000 Female Terminator is used to begin or end the NMEA 2000 Backbone. It should be installed on one side of a Micro-Tee. A Maretron NMEA 2000 Power-Tee is used to power your NMEA 2K network. Raymarine’s CP470 is a high performance CHIRP Sonar providing best in class target separation and high resolution CHIRP images. Reaching Depths of up to 10,000ft (dependent on transducer selected) the CP470 is a top choice for offshore fisherman. Compatible with a, c, e, eS and gS Series. Raymarine’s CP570 CHIRP Sonar Module is designed with the Professional or Tournament Fisherman in mind. Compatible with the a/c/e/eS/gS Series of MFD’s the CP570 Wide Spectrum CHIRP Sonar is designed for offshore and rough waters and offers a maximum of 4kW output power using 2 independent CHIRP channels to target fish, identify bait and reach sea floor down to 10,000 feet. The RV100 From Raymarine provides RealVision Sonar to Compatible Axiom RV and Axiom PRO RVX Displays. View Structure and Fish with life-like quality of RV 3D Sonar. The RV200 Bronze Thru-Hull Transducer from Raymarine provide RealVision Sonar to Compatible Axiom RV and Axiom PRO RVX Displays. View Structure and Fish with life-like quality of RV 3D Sonar. Designed for boats with a flat bottom / deadrise of 0-5-degrees. The RV300 Plastic Thru-Hull Transducer from Raymarine provide RealVision Sonar to Compatible Axiom RV and Axiom PRO RVX Displays. View Structure and Fish with life-like quality of RV 3D Sonar. Designed for boats with a flat bottom / deadrise of 0-5- degrees. Raymarine Low Profile, Thru Hull, 20-degree tilt Conical High Frequency CHIRP Transducer. The CPT-S is compatible with Raymarine’s CP100 sonar module and embedded CHIRP Multi-Function Displays. Raymarine’s Transom Mount Conical High Frequency CHIRP Transducer is compatible with Raymarine’s CP100 sonar module and embedded CHIRP Multi-Function Displays. Benefit from CHIRP sonar at a low price. Raymarine’s CPT-S Conical High Frequency Thru Hull CHIRP Plastic Transducer is compatible with Raymarine’s CP100 sonar module and embedded CHIRP Multi-Function Displays. Benefit from CHIRP sonar at an affordable price. Raymarine’s CPT-S Conical High Frequency Thru Hull CHIRP Bronze Transducer is compatible with Raymarine’s CP100 sonar module and embedded CHIRP Multi-Function Displays. Benefit from CHIRP sonar at an affordable price. 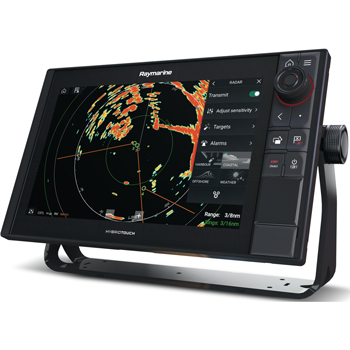 A 12” Hybrid Touch Chartplotter built with RealVision and 1kW Sonar, The Axiom Pro 12RVX enables both touch and keypad control providing intuitive Control and Powerful Performance. Detailed Navionics Plus Charting covers all of North America.